I want to note that I received this book for free from Blogging for Books for this review. My review is honest and all thoughts are my own. An inviting exploration of “the new hygge“: the Swedish concept of lagom–finding balance in moderation–featuring inspiration and practical advice on how to find a happy medium in life, home, work, and health. Following the cultural phenomena of fika and hygge, the allure of Scandinavian culture and tradition continues in the Swedish concept of lagom. From home design and work-life balance, to personal well-being and environmental sustainability, author Anna Brones presents valuable Swedish-inspired tips and actionable ways to create a more intentional, healthy lifestyle. Instead of thinking about how we can work less, lagom teaches us to think about how we can work better. Lagom at home is about finding balance between aesthetics and function, focusing on simplicity, light, and open spaces. Health and wellness in lagom is a holistic approach for the body and mind–including connecting more in person, caring for self, managing stress, keeping active, and embacing enjoyment in daily routine. Live Lagom inspires us to slow down and find happiness in everyday balance. First off I want to say that this book is set up and organized in a wonderful way. It has chapters based off of home , work, environment, and many more. It is great because if you ever feel like you need a refresher in a given area after your initial read you can go right to that. I think it is great because it facilitates the opportunity to work on only what you need to work on and focusing on that instead of having a very broad topic that makes it difficult for the reader to apply is to a specific part of their life. Another thing I liked about this book was the fact that it was realistic. The book gave practical advice and was to the point. No where in this book did I find ideas or tips that were far out there. It is created in a way that people will actually be able to adapt it into their daily lives at their own pace. Another bonus is that the information was portrayed in a way that read nicely. There was not time while reading this that I wanted to put it down because I was bored, hated the writing, or felt it was too fake/cheesy. This book found the perfect between life/lifestyle advice and being meaningful. One fault I did find with this book was that at times I felt like the book made this transition seem easier than it actually is. Changing your lifestyle and finding a balance takes a lot of work and dedication. That is why I stress that this is at your own pace. Take small or big steps to transition into the lifestyle you want. It is your journey, you determine the best way for you. 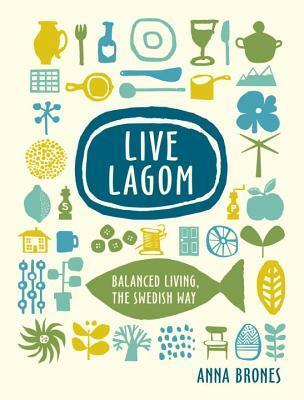 I think that Live Lagom by Anna Brones is a great introduction to balanced Swedish living. There are little tips, facts, recipes, and great visuals to give you a true sense of what she is talking about. It gives great insight into how you can evolve the different aspects of your life. Overall I give this book a 4 out of 5 stars. I know that this book is one I will be keeping and referencing from time to time.